See all items in the store. 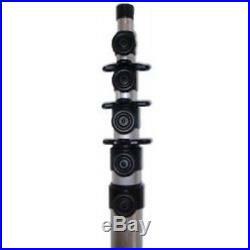 33ft 10m Aluminium Telescopic Portable Antenna Mast Kit 6 Section 2.2m Collapsed. Our Stock Code: 12085. From Our Wiltshire Based Store TODAY! Need advice on this item, or another? We’d be glad to help! Call: 01980 347001 (quote item number 12085). We’d Be Glad To Help! Call: 01980 347001 , quoting item number 12085. A fantastic quality and great priced mast. This fully telescopic mast can be extended anywhere from 2.2 metres all the way up to a whopping 10.06 metres, as each section has an indpendent thumb screw locking mechanism that will prevent the mast from slipping. Offering the added benefit of integrated circular guy rings on each section (each guy ring offers 3 guy line mounting points), this mast has a variety of uses – but is perfect for fixed or portable installations of light to medium weight two-way radio antennas, such as amateur radio, PMR & CB/10m antennas. Full’no rust’ aluminium construction the mast is fully weatherproof and has section end bungs allready fitted, so will never let the rain in, or’lock up’, and can be left outside all year around. Integrated Guy Rings: Yes. Locking Mechanism On Each Section: Yes. Diameter: 5.08cm / 2″ (Bottom) – 2.54cm / 1″ (Top). Extended Length: 10.06 Metres (33′). Collapsed Length: 2.20 Metres (7.2′). Number of Sections: 6. Section Length: 2.03 Metres (80). Maximum Head Load: 5kg Variable (Dependent on wind speed and mast length). Customer collections are welcome by prior appointment. We have daily carrier collections which are made between 4 and 6pm. All orders placed prior to 3pm (and offered as a same day despatch item) are normally fulfilled same day. Orders made after this time (and before 7pm) can also normally be fulfilled same day, however if your order is urgent and you are ordering after 3pm then please contact our offices first to obtain a priority despatch. Please note that we are unable to accept responsibility for delays incurred by our carriers, although we will always do everything we can to help. Or fax to (01980) 347002. You can also send us a cheque, postal order or even pay in person with cash. Our contact number is 01980 347001 and our address is’Damsu Ltd, Lime Tree, Flower Lane, Amesbury, Wilts, SP4 7HE’. We pride ourselves on providing excellent service and offering high quality, A grade, factory direct products. We will accept any return within 14 days where all packaging is intact and where the item has only been opened for the purposes of assessment. If your item is faulty then we will always offer a free of charge replacement. Please note that we reserve the right to send you periodic updates on your order. We will not ever share your information with any outside party, except where required to do so by law enforcement agencies or during the course of an investigation. We may also invite you to receive periodic updates on our latest offers, which you may opt out of at anytime. All terms for international orders are offered on this basis. Our company information is as follows; Damsu Ltd. Registered in England and Wales Company No. Registered Address: The Old Workshop, Lime Tree, Flower Lane, Amesbury, Wiltshire, SP4 7HE. Call: +44 (0) 1980 347001 Fax: +44 (0) 1980 347002. Sample description here Sample description here Sample description here Sample description here Sample description here. Excludes UK public holidays. The item “33ft 10m Aluminium Telescopic Portable Antenna Mast Kit 6 Section 2.2m Collapsed” is in sale since Monday, December 29, 2014. This item is in the category “Mobile Phones & Communication\Radio Communication Equipment\Ham/Amateur Radio\Ham Radio Transceivers”. The seller is “damsu_co_uk” and is located in Amesbury, Wilts. This item can be shipped worldwide.